This season’s Topps® MLB All-Star Rookie Team features one of the strongest classes in its 58-year history with record breakers, rising stars and potential award winners. Eleven MLB players were named to the Topps All-Star Rookie Team led by New York Yankees outfielder Aaron Judge and Los Angeles Dodgers outfielder Cody Bellinger, both frontrunners for their league’s respective Rookie of the Year Awards. The Topps All-Star Rookie Team was officially unveiled on MLB Network’s Hot Stove today. 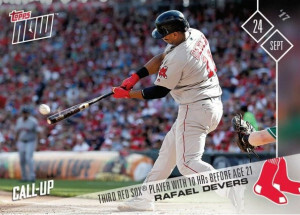 Three MLB teams had multiple players named to the Topps All-Star Rookie, including the New York Yankees with Judge and left-handed pitcher Jordan Montgomery; the Boston Red Sox with outfielder Andrew Benintendi and third baseman Rafael Devers; and the Milwaukee Brewers with catcher Manny Pina and relief pitcher Josh Hader. Other members of the Topps All-Star Rookie Team include Chicago Cubs’ second baseman Ian Happ, St. Louis Cardinals’ short stop Paul DeJong, Baltimore Orioles’ outfielder Trey Mancini, and Colorado Rockies right-handed pitcher German Marquez. Last year’s Topps MLB All-Rookie team included a number of players that competed in the 2017 World Series including Houston’s Alex Bregman, and Los Angeles’ Corey Seager, and Kenta Maeda.